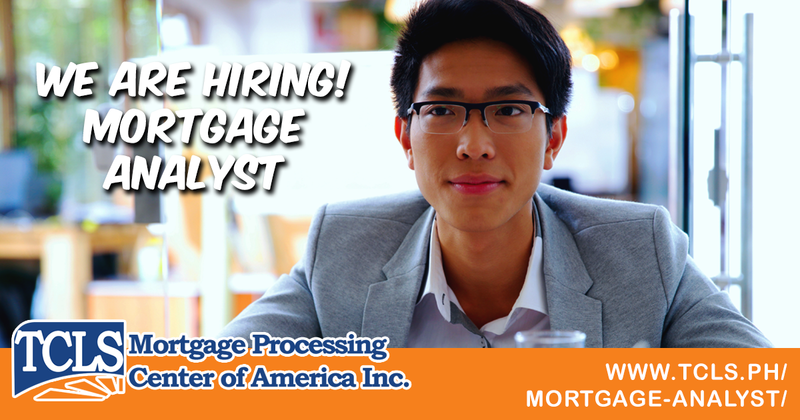 TCLS Mortgage Processing Center of America, Inc. is currently hiring MORTGAGE SPECIALIST to be assigned at their office in Shaw Blvd., Mandaluyong City. Starting salary is above minimum wage so we are encouraging you to apply for the position. 1-year experience in a US-based call center is an advantage but not required. Candidate must possess at least a Bachelor/College Degree in any field. No work experience in US mortgage required. 1-year experience in a USbased call center required is an advantage but not required. Good analytical and time management skills. Verify documentation supplied with the mortgage application compared to the required checklist. Identify and communicate to the MLO or Processor if documentation is incomplete or missing.